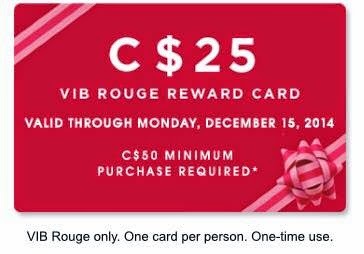 *Must be VIB/VIB Rouge by October 1st 2014. These are usually mailed out in U.S. and emailed in Canada. If you don't receive it by December 3rd, then call 1-877-737-4672 to verify your account status. These can be redeemed online & in-stores from December 3rd to December 14th (VIB/VIB members get an extra day, so theirs expire on December 15th). Each person gets an unique code that can be used only once online or in-store. Can they be used with regular gift cards? No, you can't use your regular gift card with this holiday card. Not sure what to pick up? Here are some products that I'd recommend getting!